How to soften water at home is a question often asked by homeowners who are concerned about the health of their family and integrity of their pipes and appliances. 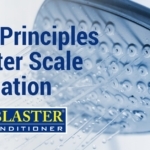 ScaleBlaster is an electronic water descaler/hard water scale remover that can be easily installed on the incoming water pipe of your home. However, to understand how this electronic descaler is effective in pipe scale removal and overall water scale removal, it would be helpful to know how water scale forms in the first place. When it rains, water absorbs the CO2 gas in the air and becomes acidic. The acidic rain water then passes over and permeates through rocks such as limestone, seashells and marble and forms soluble calcium ions and bicarbonate ions. Then, any condition which alters the solubility of calcium bicarbonate will result in the precipitation of calcium carbonate – a.k.a. scale. When hard water comes in contact with metal, the electrostatic attraction between the metal surface and scale-causing materials causes it to stick to surfaces. If you would like to learn more about how to soften water at home, consider reading our follow-on article discussing the Basic Principle of Scale Elimination. 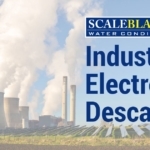 We will discuss in depth how an electronic descaler is effective when it comes to water scale removal. In fact, it is a safe, cost-effective and environmentally friendly option pipe scale remover and overall hard water scale remover compared to other water scale removal options such as water softeners. 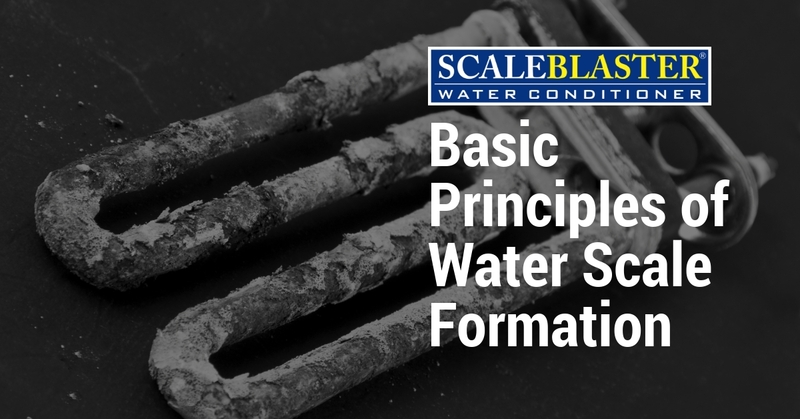 Interested in learning more about the science of water scale formation? Read our detailed brochure Principles of Scale Formation Elimination.